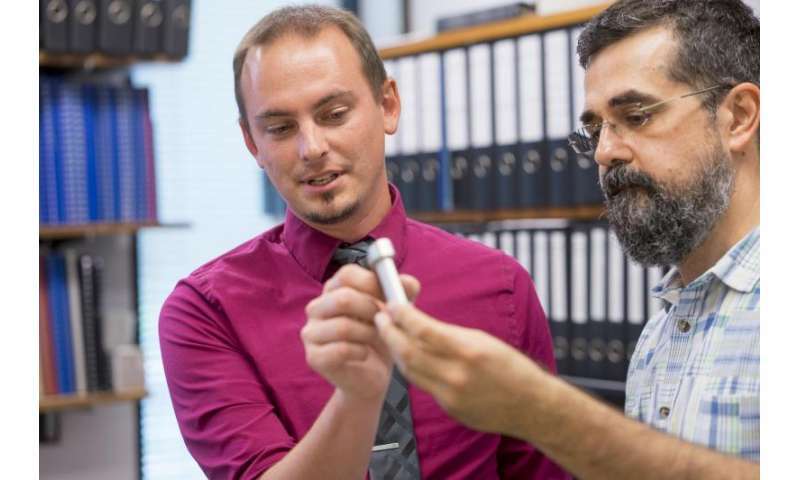 A Purdue technology being developed could provide a more effective way to efficiently deliver coolant to turbine blades in gas turbine engines, one of the most widely used power-generating technologies. The innovation could potentially make engines on a global scale more efficient, safer and environmentally friendlier. Adam Weaver, a Purdue alumnus who earned a master's degree from the School of Aeronautics and Astronautics, developed a geometric configuration during graduate school to better cool turbine blades. The design was developed from the perspective of high technology fluid dynamic and heat transfer experts who used precise characterization of fluid flow fields to then develop a geometric configuration which controls the coolant structures to cool the blades in the most effective way. Weaver said finding ways to use coolant more effectively and delivering it to precise locations is a huge area of research that is in need of a more advanced solution. "When gas turbine engines run at increasingly hotter temperatures, the system as a whole exemplifies higher efficiency, less fuel consumption and more power. However, the first thing the hot gas encounters right after the combustion chamber is the turbine blades. These extremely hot gases can cause the blades to melt or fail, so it's vital the blades are kept cool and the engine can run as hot and as efficient as possible," he said. "The coolant used is actually just compressed air. However, in order for the coolant to be pumped inside the blades the engine has to use part of its energy to do so, making it overall less efficient. The idea is to use as little coolant as possible while achieving very effective cooling. Many current systems extract much more coolant than is necessary and pump it through regardless of its impact on the engine." Weaver used new processes to discover an optimal design to deliver coolant efficiently. "The idea of cooling in general is certainly not new, but my work leveraged new manufacturing processes to investigate configurations which could not be produced previously. The Weave Design is the most efficient design in this new design space," he said. "In order to determine what design would work best I looked at three performance characteristics: an efficient cooling system, an effective cooling system and cooling uniformity. In addition to effectiveness and efficiency, uniformity is very important because if it's not uniformly cool then hotspots will decrease the durability of the blades, eventually causing them to fail. While others may have focused only on effectiveness of cooling, we tackled all three characteristics simultaneously and achieved a much higher degree of success for each criteria than the other kinds of designs." The Weave Design could provide multiple benefits to engines and manufacturers. "The design I've developed doesn't involve just throwing more air at the blades like traditional methods, but involves using the coolant more efficiently. It's able to reduce the amount of cooling flow required by up to 35 percent while providing the same amount of cooling," Weaver said. "Along with the increased confidence this effective cooling brings, it also allows extended intervals between maintenance, thereby reducing the hassle and saving money from both fuel savings and better engine life." Weaver said the design can also have a huge impact on the environment. "With the Weave Design you will get more engine output per unit of fuel, as you're burning the fuel more effectively, therefore reducing emissions and saving money," he said. "Although the design hasn't been fully qualified in an entire system, anytime you make the burning more efficient you're going to reduce the emissions and you're going to make a more efficient conversion of energy." Weaver's technology has been patented through the Purdue Research Foundation Office of Technology Commercialization. The license was optioned by Mechanical Solutions, an engineering consulting firm that Weaver currently works for. Mechanical Solutions received a $150,000 Phase I SBIR grant for nine months from the U.S. Air Force. The funding was used to further develop Weaver's technology and produce a prototype to undergo testing at Maurice J. Zucrow Labs at Purdue. "The Weave Design was originated and analyzed computationally, in which it underwent a lot of analysis, comparisons to other designs and integrations into multiple simplified conditions," Weaver said. "We then manufactured a prototype and were able to prove the cooling effectiveness of a flat, generic test piece. The prototype results were extremely favorable, but larger scale testing is still required. Unfortunately for something like this we're unable to have the product entirely completed before marketing it because of the fact that it requires the a good deal of research for integration into a specific customer's engine." Weaver is seeking federal funding or partnerships with original equipment manufacturers to integrate the system into an exact engine and qualify the design. "Right now we either need additional funding or a partnership with an OEM to be able to integrate it into an exact engine, test and prove the experimental results which we have already proven computationally," he said. "At that point the OEM could then purchase the design and integrate it full time into their engines."